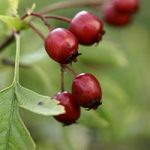 Many of the hawthorn (Crataegus) family bear nice edible fruits with an apple-like flavour. We have a selection available of the best we have found for taste and good cropping. These are all bare-rooted trees on native hawthorn rootstock – any native haw suckers which grow should be removed. All are bare-rooted trees.